Growing concerns for public safety combined with new advancements in technology are challenging schools and businesses to be ever more effective in how they issue emergency alerts and warnings. In the past, emergency communications systems in most buildings relied primarily on a combination of alarms, signage, and intercom systems. Now, new technologies allow building managers and school officials to be able to more quickly and effectively issue alerts and warnings with the use of high volume, mass notification systems (MNS) — one-way emergency messages delivered in real-time via the telephone, a text message, an email, reader boards, or by television or radio. MNS will never replace traditional emergency alert and warning systems. However, the rapid increase in the adoption of MNS by schools and businesses make it important to understand what is required for effective communications in emergency situations regardless of the systems used. The National Fire Protection Association (NFPA) 72 National Fire Alarm and Signaling Code Annex G.2 -- Guidance on Emergency Communication Strategies -- provides guidelines that are broadly applicable to any type of emergency notification system, including both traditional systems and MNS. In this article, Koorsen summarizes the information in Annex G.2 to help you better understand how alerts and warning messages should be created, formatted, and disseminated. Most people think of alerts and warnings as the same thing. However, for those responsible for emergency communications, alerts and warnings are used for two distinctly different purposes. An alert is intended to grab people's attention in an emergency situation and to notify them that there is important information they need to receive. A warning is the important information following the alert -- a message intended to provide instruction on the situation and how to respond. The NFPA 72 Annex G recommends that alerts and warnings be disseminated separately, and one should never be disseminated without the other. Similarly, in this article we’ll cover both types of emergency communications separately to help you better understand the recommendations for each. One of the most important characteristics of any alert is that it be distinctly noticeable in the environment for which it is designed. Audible alerts should be very different from the normal background noise in the environment. The reason for this is obvious -- if an alert is not noticeable enough to get the occupants' attention, they might miss the warning messages that follow. Therefore, the system should be designed to reduce the background noise when issuing an alert. For visual alerts, flashing lights are preferable to static lights. It is also best to have one standard color for all visual alerts within a building or multiple buildings on a corporate or school campus to avoid any confusion as to what the lights mean. In addition to audible and visual alerts, the NFPA 72 Annex G identifies other types of alerts that can be used, including disruption of routine activities, tactile methods, social networks, and face-to-face alerts. 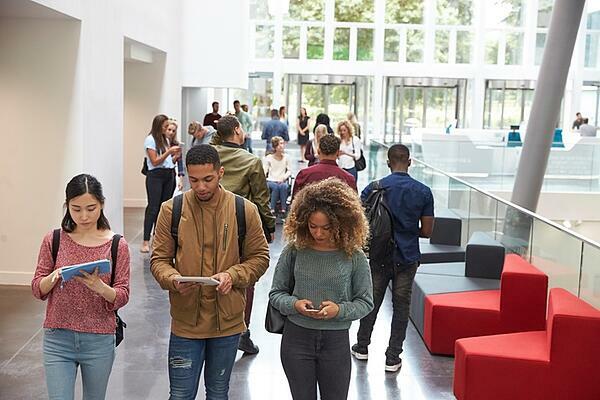 Of these, social media MNS are quickly gaining wider use in schools and businesses today due to the large number of people who now own a mobile device. Mobile devices can be an ideal way to provide both alerts and notifications because they not only notify and provide safety instructions to those immediately in harm’s way but they can also serve to keep others away from the area while the situation is unfolding. Testing of your emergency alert system is critical to ensuring that it performs as expected and that people pay proper attention to it when activated. Regular occupants of your school or business should also be trained in how to respond to an emergency alert and their response evaluated after each test of the system. The purpose of a warning message is to provide information on the state of emergency and what to do to keep themselves safe such as whether to evacuate or shelter in place, lock down the facility, etc. Warning messages can be disseminated in a variety of forms including audible, visual, or tactile messages. Regardless of the form in which a warning is issued, its effectiveness relies not only on the information it conveys but how it is structured. The NFPA 72 Annex G provides guidance on several factors that must be considered when crafting an emergency warning message. The source of the message (the "Who") — Stating the source of the information up front helps to get people's attention, especially if it is one they do not normally hear from on a regular basis. It is also important that the source of the information is a person or authority that people in the building consider credible. Otherwise, there is a risk that the information will be disregarded. A description of the emergency (the "Why") — People need to know why they must act. Describing the hazard and its dangers as well as the potential consequences to those who do not follow the instructions is a critically important component of any emergency warning. Instructions on how to respond (the "How") — People need to know what to do in an emergency situation, including the specific actions they should take and how to take them. This information must be kept as simple as possible so that people clearly understand what to do next. In cases where the necessary actions require multiple steps, it may be useful to use a numbered list when providing instructions. The location of the emergency (the "Where") — Not every emergency involves an entire building or campus. It is important to state where the emergency situation is taking place so that the people in that location can respond and people in other locations know to stay away from the area. When people need to react (the "When") — In most emergency situations, people will be expected to react immediately. However, this should never be assumed -- it must be stated explicitly in the message. The order in which the information in these five elements should be disseminated depends on how long the emergency warning message is and is summarized in the table below. We should note that the NFPA 72 Annex G does not clearly define what constitutes a short message versus a long one. However, the example cited in the Code for a "short" message is 90 characters. For shorter messages, the NPFA recommends formatting the message as a series of bullets with each element presented under a separate bullet. NPFA 72 Annex G also includes specific guidelines for the wording of your emergency messages. These guidelines focus on ensuring that your messaging is easily understood by those who receive it. Keeping the message as short and simple as possible is vitally important. The NFPA recommends messages be written at a sixth-grade reading level or lower. This can be measured with the Flesch-Kincaid Grade Level Formula, which is available in most popular word processing software programs on the market today. Active: Evacuate the building immediately. Passive: Immediate evacuation of the building is required. It is important to anticipate that multiple messages may be necessary in an emergency situation. Updates are often needed as conditions change and should include an explanation of why the information has changed. You should also prepare feedback messages to use after false alarms and testing of your emergency alert and warning system. These messages serve to inform occupants why the event did not occur and that the system performed as expected. The NFPA 72 Annex G recommends that voice announcements be accompanied by simultaneous visual text. This is likely because visual warnings have different capabilities and limitations than audible messages. Given this, there are a number of additional factors to consider depending on the type of warnings you use. With visual warnings, issuing them as separate, discrete messages as opposed to a sequentially displayed message will be more effective because it will trigger repeated alerts, increasing the likelihood that they will be noticed and followed. Making sure your warning signs also conform to the requirements of the Americans with Disabilities Act (ADA) requirements for signage in addition to the NFPA 72 Annex G recommendations will help to ensure that people who are visually impaired will be able to understand them. Audible warning systems include public address systems (also known as voice notification systems), automated voice dialing, radio and television broadcasts, and tone alert radios that issue a high-pitched squeal just prior to an audio announcement. Audible warnings can be delivered live by an individual, prerecorded, or generated by text-to-speech software. There are different benefits with each of these types of systems. For example, voice messages can be updated with new information while at the same time, conveying the appropriate level of urgency. Audible messages should be spoken at a rate of approximately 175 words per minute by individuals without strong accents. You should also be selective in terms of how much urgency you build into your messages. While it is critical to convey a sense of urgency when providing instructions regarding immediately dangerous and/or potentially life-threatening situations, over-emphasizing the urgency of less threatening situations can lead to non-response in future emergencies. Messages should also be disseminated using a combination of push and pull technologies. Push technologies — one-way communications that do not require a response — are most appropriate for alert signals and initial warning messages while pull technologies that prompt the recipient to seek additional information are better for messages of a less urgent nature. Is Your Emergency Alert and Warning System as Effective as it Could Be? If you haven't reviewed your emergency alert and warning system lately, now might be a good time. Koorsen can help with multi-channel solutions that can quickly get your message out to everyone no matter where they may be before, during, and after any emergency. Schools and businesses that need to communicate quickly and effectively during emergency events can rely on Koorsen to make sure that every message is always received. Contact us today to enjoy the peace of mind that having a modern, comprehensive emergency notification system can provide. Campus Safety Magazine recommends a number of best practices for emergency notifications that can help you build upon the guidance and requirements offered in the NFPA 72 Annex G. These practices are equally applicable to businesses and are particularly valuable in the design of your emergency alert and warning systems. If your buildings undergo any type of construction or extensive renovations, it's also important to verify your existing notification systems (sirens, loudspeakers, SMS text alert systems, etc.) will still provide adequate coverage. Contact Koorsen Fire & Security today to learn more about mass notification systems for clearly and effectively communicating emergency situations in businesses and schools. Disclaimer: The information in this article is for informational purposes only. It is believed to be reliable, but Koorsen Fire & Security assumes no responsibility or liability for any errors or omissions in the content of this article. It does not constitute professional advice. The user of this article or the product(s) is responsible for verifying the information's accuracy from all available sources, including the product manufacturer. The authority having jurisdiction should be contacted for code interpretations.